Pro Earth Floor Strip | Pro Chem, Inc. 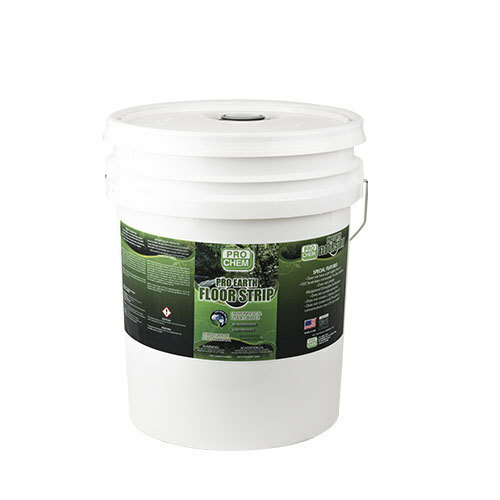 PRO EARTH FLOOR STRIP is a highly concentrated, low odor, environmentally preferable wax stripper to be used for removing PRO EARTH FLOOR SHINE. It quickly penetrates multiple coats of builtup, aged finish. It even works with cold water and is strong enough to remove conventional metal interlocked finish as well. It is dye and fragrance free and does not have a pH higher than 12.0. Dilute one part PRO EARTH FLOOR STRIP to four parts cold water for heavy buildup. Dilute one part PRO EARTH FLOOR STRIP to twelve parts cold water for normal buildup. Spread solution liberally to floor area and surface and soak for 5-10 minutes prior to scrubbing. Rewet as needed. Hand or machine scrub with black pads or stripping brushes. To pick up solution after stripping, use a wet/dry vac, auto scrubber or mop. Rinse floor thoroughly. Do not use on wood, painted or rubber surfaces.